An unusual automatic toothbrush which could help the user in the early hours of the morning in cleaning their teeth and remove plaque in only 10 seconds will be coming up shortly. It is said to the first fully automatic toothbrush in the world. Its patent pending device which brushes all the teeth at once is totally automatic and completes the cleaning in only ten seconds. All that is needed is to press a single button, wait for ten seconds and the user will have perfectly clean teeth. 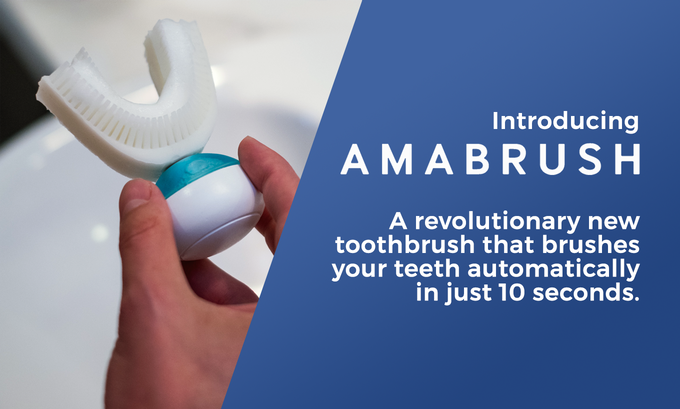 All the units of Amabrush seem to be equipped with a sound and light indicator which enables to signal several diverse information regarding the prevailing battery status, finished tooth-brushing sessions, flaws, together with other scenarios. Moreover, their specifically formulated toothpaste has been provided in big bottles together with more durable as well as steady reusable toothpaste capsules. This would be economical in saving shipping fees as well as the complete cost for the user. According to its manufacturers, the brush seems like a bristly mouth guard that has the tendency of dispensing toothpaste and vibrates in order to clean every tooth. With the worldwide shipping beginning in December, customers can now pre-order the device for £70 ($90). In order to utilise the device, the user can put the toothbrush in their mouth and press on a button to begin the cleaning procedure. The system is said to utilise tailored toothpaste capsule that comes at a price of £2.60 ($3.40) and tends to last for around a month. The manufacturers of this brush had stated that the device has been made from bacteria-resistant silicone featuring 3D bristles on both the sides. According to its inventors, the material is said to be adequately soft to avoid gum disease though hard enough to clean the teeth. They have also informed that since the material tends to be flexible, one type of size would be appropriate for both men as well as women. The device is said to send out tough vibrations having amplitude of 9.5G, utilising a process to differ the waves of vibrations. The creators had mentioned on Kickstarter that `even in 10 seconds, every tooth surface has been cleaned longer compared with common brushes. If one brushes their teeth for the recommended 120 seconds with a regular toothbrush, every surface tends to get brushed for just 1.25 seconds. They have further added that Amabrush tends to brush all your surfaces for the whole of 10 seconds. The toothbrush would be required to be replaced once in two to three months in order to be effective as per the makers. It accomplishes all the recommended methods where the bristles are aligned in a 45° angle against the line of the gum and are said to be adequately soft to rub rather than to scratch. Moreover the pressure against the teeth seems to be quite light and the subtle vibrations are said to move the bristles back and forth enabling them to eliminate the plaque, while keeping the gums from getting damaged. It has been created to make tooth-brushing less troublesome where some may tend to hate brushing their teeth and may not brush the areas which need to be cleaned. Some may not be inclined in brushing correctly. The purpose of focus is – right tooth-brushing for one and all which is done automatically.